It has proven to be an exciting year in Utah politics, with medical marijuana on the ballot and at least one tight house race. And the Beehive State seems to be buzzing with political energy, something normally unnoticed by young voters. With apps like Snapchat and Instagram pushing voter registration, being involved in the political process is becoming mainstream this year. However, voting in a district or state race isn’t the only way students can have an impact. 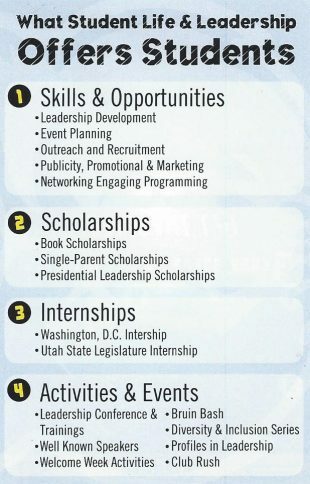 The Salt Lake Community College Student Association (SLCCSA) offers opportunities to give back and participate in something that creates change. Martinez has served in the student association for two years in various roles, starting as a liaison on the clubs and organizations board. He now finds himself at the helm of its decision-making process in the executive council. Martinez says he didn’t always have a sense of civic duty and didn’t initially see “the value” of participating in student government. Like many students at SLCC, Martinez is a first-generation college student and initially applied to SLCCSA for the student life and leadership scholarship. He now sees greater value in it than just paying for his classes. “I want to be the support system first-generation students need, for questions they can’t ask teachers,” he explains. His commitment to first-generation college students extends to anyone at SLCC who needs guidance. He once found himself in their shoes after finishing high school. The association has college veterans to explain everything if you need some guidance, which he desperately needed when he first came to SLCC. Martinez said SLCCSA surrounded him with resources and people to rely on when he found himself struggling to decide on a degree. He now staunchly believes in getting involved any way possible. Being involved, he explains, is not just about being civically engaged but surrounding yourself with people and resources who want to succeed. Martinez explained that SLCCSA encourages students who have a passion or strength to lead with that when applying. The association is dedicated to getting students in the best possible role. If a student isn’t sure where they fit in the association, Martinez guarantees they have a spot in SLCCSA for them. Chase Larson, SLCCSA executive vice president, could be found in the halls at Taylorville campus in late September spreading flyers for involvement. He’s looking to highlight that getting started at SLCC’s Student Association is simple. Being executive vice president means Larson also sits on the Student Senate as president. He is hoping to fill vacant student senate seats for the South Region; the School of Science, Mathematics and Engineering; and the School of Arts, Communication and Media. “We are running at about 80 percent effectiveness, but we are headed towards 100 percent,” he says. The Student Senate’s main goal is to listen to students and talk to the right people and coordinate between departments to enact change, Larson said. The Senate is currently working on a few issues right now, including a suggestion box for students to anonymously air complaints, refrigerated lockers, and reviewing the new parking system. Students looking to get started in SLCCSA only need to follow a few simple steps to begin. According to Martinez, there is a spot for everyone, and those on the association want to help each student find their role. Senate and Executive Council meetings are also often open to all students or those interested in seeing what the association does. Senate meetings are held in the Senate Chambers at Taylorsville campus on Tuesdays at 1 p.m. and executive council meetings are held in the Senate Chambers on Thursdays at 1 p.m.